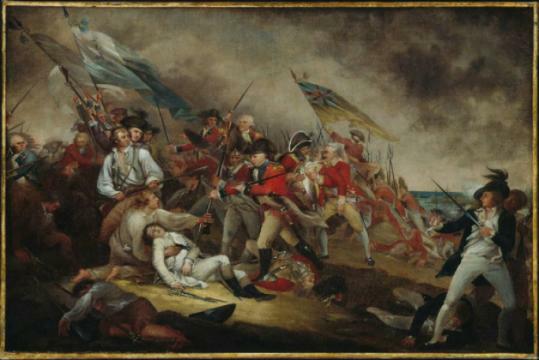 For many Bostonians, Joseph Warren may be best remembered as the Revolutionary War hero depicted in John Trumbull’s painting “The Death of General Warren at the Battle of Bunker’s Hill’’ in the Museum of Fine Arts. For others, he’s the inspiration for Warren Street in Roxbury, or the source of an ongoing feud over a statue on the campus of the Roxbury Latin School. While historians agree on Warren’s importance — he held prominent positions in revolutionary organizations and served as president of the Massachusetts Provincial Congress before his death at 34 — there has been less clarity on his final moments, which are romantically depicted in Trumbull’s painting. Warren’s comrades claimed the soldier-physician heroically shouted, “I am a dead man, fight on,’’ after being shot in the front of the head while rushing toward oncoming troops; some redcoats claimed he was shot in the back of the head while fleeing British attacks. Now, the early American hero — and the painter who celebrated him — may be one step closer to vindication. Derek Beck, who is researching a book on the Revolutionary War, says he has uncovered once-lost photographs of Warren’s interred skull that indicate a bullet entered through the front. That would suggest Warren was facing British troops when they shot him. Score one for the Continental Army. Ultimately, though, those who explored the wheres and hows of Warren’s wounds were always on a foolish mission. There’s nothing inherently dishonorable about a well-considered retreat, and determining which side of the head he was shot on doesn’t settle much, either. People can turn around while running away, and look backwards while heroically charging. Warren’s fame rests on his leadership in pre-revolutionary Boston; the circumstances of his death are nothing but a historical curiosity.